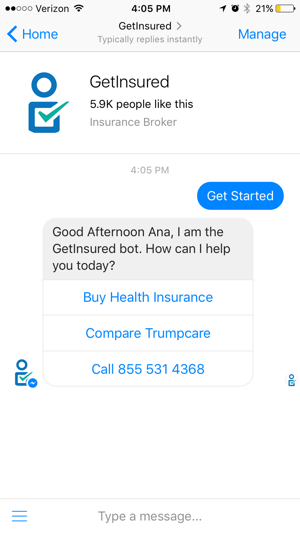 Be the first in your business to have a Chat Bot! The first thing they do is show everyone how cool it is. Can You ask For More? Free Viral Marketing!!!! Chat bots are computer programs that mimic conversation with people using artificial intelligence. They can transform the way you interact with the internet and now with chat platforms like Facebook Messenger & WhatsApp from a series of self-initiated tasks to a quasi-conversation. These new developments in technology have opened doors to a faster, easier solution: chatbots. A chatbot can have a conversation with a customer but isn’t limited by technology because the AI technology is built in to the software. 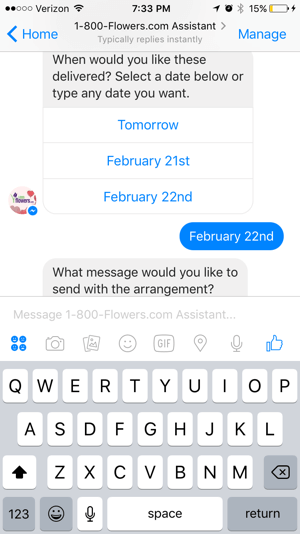 In most cases, chatbots use messenger apps to communicate with customers. A person can type or ask a question and the chatbot responds with the right information. Depending on the situation, many chatbots can learn from what a customer says to personalize the interaction and build off previous interaction. For example, if a customer talks with a chatbot and asks for movie recommendations, the chatbot can remember which movie the customer saw and follow up with it later when providing a recommendation for a restaurant or another movie. Chatbots have the ability to dig through huge amounts of data to pick out the best nugget for a customer, weather it is a troubleshooting solution or a recommendation for a new product to try. Chatbots can be useful in many aspects of the customer experience, including providing customer service, presenting product recommendations and engaging customers through targeted marketing campaigns. If a customer has an issue with a product, she can connect with a chatbot to explain the situation and the chatbot can input that information to provide a recommendation of how to fix the product. On the recommendation side, chatbots can be used to share popular products with customers that they might find useful and can act as a sort of personal shopper or concierge service to find the perfect gift, meal or night out for a customer with just a few basic questions. Brands are also using chatbots to connect their customers with thought leaders and add personality to their products. In all cases, brands seem to be having great success and experiencing increased engagement and revenue. Chatbots are easy to use and many customers prefer them over calling a representative on the phone because it tends to be faster and less invasive. They can also save money for companies and are easy to set up. Because most chatbots use messenger apps that are already on billions of phones around the world, chances are your customers are already plugged in and ready for your bot. Chatbots are the future of customer experience and have the power to replace search windows and many apps in the not-so-distant future. 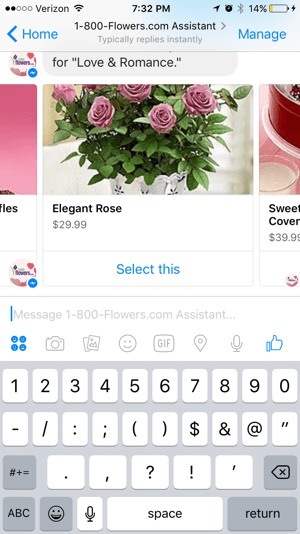 ​Why Use Chatbots?Increasing numbers of consumers are turning to social media messaging, including Facebook Messenger, to contact businesses with questions, comments, and complaints. While there are tools that will help you manage the influx of customer messages, sometimes they’re just not enough, particularly when social users are accustomed to a timely response from you. #1: Deliver Personalized Content ExperiencesSome businesses use chatbots to focus solely on content; the chatbots serve as an extension of their content marketing strategy. These bots nurture relationships with clients and provide immediate value without any work on the user’s part. Always ask “Did you want to look at anything else before you check out?”because users may be willing to look at and purchase add-on items. ChatbotFrom Wikipedia, the free encyclopediaA chatbot (also known as a talkbot, chatterbot, Bot, IM bot, interactive agent, or Artificial Conversational Entity) is a computer program which conducts a conversation via auditory or textual methods. Such programs are often designed to convincingly simulate how a human would behave as a conversational partner, thereby passing the Turing test. Chatbots are typically used in dialog systems for various practical purposes including customer service or information acquisition. Some chatterbots use sophisticated natural language processing systems, but many simpler systems scan for keywords within the input, then pull a reply with the most matching keywords, or the most similar wording pattern, from a database. The term "ChatterBot" was originally coined by Michael Mauldin (creator of the first Verbot, Julia) in 1994 to describe these conversational programs. Today, chatbots are part of virtual assistants such as Google Assistant, and are accessed via many organizations' apps, websites, and on instant messaging platforms such as all. Non-assistant applications include chatbots used for entertainment purposes, for research, and social bots which promote a particular product, candidate, or issue.